2017 was a record year for Porsche. Based on the data we have since January, it looks like 2018 is shaping up to be another record year. In the first quarter of this year Porsche AG delivered around 63,500 vehicles worldwide. This represents an increase of 6% over 2017. North America and Europe have shown the most substantial growth, though the Asian and African markets have also grown this year. Deliveries in the US increased 10% to around 14,000 total vehicles. China was again the largest individual market for Porsche. 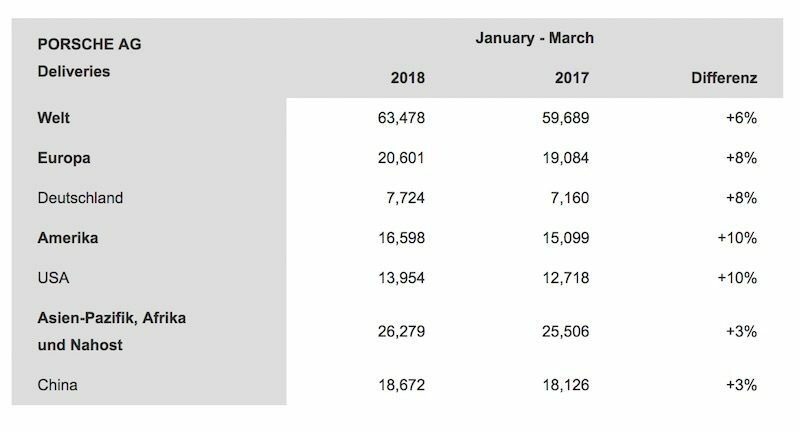 More than 18,600 vehicles were delivered in the first quarter of 2018, showing growth of 3%. In all of Europe more than 20,600 vehicles were delivered, 7,700 of which found homes in Germany. Growth in both the German and overall European market were 8%. The most impressive growth in a single model came from the Panamera. The new model, introduced in 2017, showed a sales increase of around 200%. Hybrid models have also performed well, and more than 60% of Panameras sold in Europe this year have been hybrids. This growth parallels Porsche's future electric goals. The Mission E Cross Turismo study, which debuted at the Geneva Motor Show, demonstrates Porsche's future trajectory with electrification. “The success of our hybrid models shows that the application of values typical of the Porsche brand to this drive technology has been effective”, says Member of the Executive Board responsible for Sales and Marketing at Porsche AG Detlev von Platen. For the first quarter of 2018, Porsche's most successful model has been the Macan. 23,000 Macans have been delivered worldwide. The 911 has also been a strong seller, with more than 9,600 vehicles delivered to customers, an increase of 35% over 2017. This year's growth is exciting for Porsche. While the SUV and hybrid models have been predictably strong sellers, interest remains high in the brand's traditional sports cars. This is good news for those of us whose Porsches come use, because this year is starting off with some exciting models.